I have discussed the benefits of ginger on my site for some time now. I am particularly impressed by its anti-inflammatory properties, which make it one of the most potent home remedies you can use to relieve pain and motion sickness. Not surprisingly, the benefits of ginger oil takes you to a whole new level! Warm, spicy, and energizing, ginger oil comes from ginger root (Zingiber officinale), a pungent, peculiar-looking underground rhizome. A member of the Zingiberaceae plant family, this perennial herb grows up to three to four feet high, with narrow spear-shaped leaves, white or yellow flowers, and small tuberous rhizomes with a thick or thin brown skin. Its flesh can be yellow, white, or red, depending on the variety. Ginger is one of the most flexible food ingredients today. It can be eaten fresh or dried, steeped as a tea, or added into your vegetable juice (one of my personal favorites). 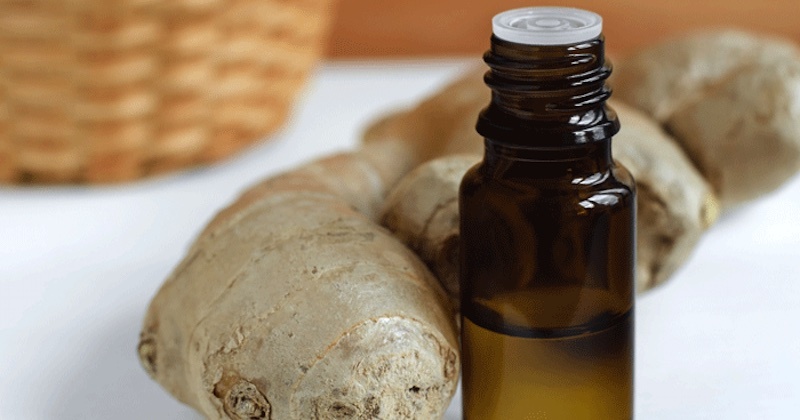 The dried root is the source for tinctures and supplements, and is also transformed into ginger oil, an energizing and uplifting oil with a wide range of uses. The benefits of ginger for relieving pain are widely known today, and while I prefer using fresh ginger (eaten raw, added into your vegetable juice, or steeped into tea), using ginger oil can provide these wholesome benefits as well. When used topically, ginger oil can help relieve aches and pain, as well as promote normal blood circulation. Aromatherapists also value ginger oil’s soothing and warming qualities to help address digestive problems. In fact, this is one of ginger oil’s most popular uses: relieving any kind of digestive upset, such as nausea, indigestion, diarrhea, gas, and even morning sickness. Here are some ways to use ginger oil for various health problems. Apply two to three drops in a diffuser, or place on a cotton ball or your handkerchief, and then inhale. This will help re-energize and revitalize your body, mind, and soul. Ginger oil benefits mostly come from its powerful mono and sesqui-terpenoids, such as neral, geranial, 1,8-cineole, zingiberene, B-bisabolene, and B-sesquiphellandrene. It also contains a-pinene, B-pinene, camphene, linalool, borneol, y-terpineol, nerol, geraniol, and geranyl acetate. A study found that ginger oil can help repel Anopheles culicifacies mosquitoes, which is the primary carrier of malaria in tropical countries. Ginger and ginger oil can help reduce prostaglandins, which are the compounds associated with pain. Using ginger oil regularly can help reduce your risk of blood clots and arteriosclerosis, as well as help decrease the bad cholesterol levels in your blood. Adults who consume ginger daily may lower their risk of coronary heart disease by 13 percent, with the probability of illness decreasing when daily ginger intake increased. Adults who consume ginger daily have an 8 percent lower risk of developing hypertension (high blood pressure). A 2005 study found ginger may lower blood pressure through blockade of voltage-dependent calcium channels. Rinse a cup of fresh ginger, including the skin, thoroughly, and let dry for a few hours. Pour the olive oil in an oven-safe bowl. Chop the ginger and then shred using a clean cheese grater. Add to the olive oil and mix well. Put the mixture in the oven and leave it to simmer under low heat (150 degrees Fahrenheit) for at least two hours. Pour the mixture through an unbleached cheese cloth to filter it and take out the bits of ginger. Once all the oil has been filtered, squeeze out the remaining oil from the cheese cloth. Transfer the ginger oil into clean vials or bottles and store in a cool dry place. Ginger oil is composed of 90 percent sesquiterpenes, which are responsible for its anti-inflammatory, antibacterial, and other healing properties. When applied topically or inhaled, it has a warming and energizing effect. Ginger oil can also be ingested, but I advise doing this under the supervision of a qualified health physician. As long as it’s not used in very strong concentrations, ginger oil is generally safe, as it is non-toxic and non-irritating. If you have sensitive skin, please do a skin patch test before using ginger oil (or any essential oil, for that matter) to see if you have any allergic reactions to it. You should also consider diluting ginger oil in other carrier oils. Some of the best choices are citrusy and spicy oils like neroli, frankincense, bergamot, ylang-ylang, rose, and sandalwood. Ginger oil may be phototoxic, so avoid applying it on skin areas that will be exposed to the sun within 24 hours after application. I also advise pregnant women and nursing moms to use ginger oil with caution, even though it has been deemed useful for morning sickness. Consult your healthcare provider before use. Avoid administering this oil to very young children as well. If you have any sensitivity to ginger root, do not use ginger oil at all. Some potential side effects of ginger oil are heartburn, sores in mouth, nausea, and skin rashes (when applied topically). If you are taking any type of medication, consult your physician beforehand before using or ingesting ginger oil.